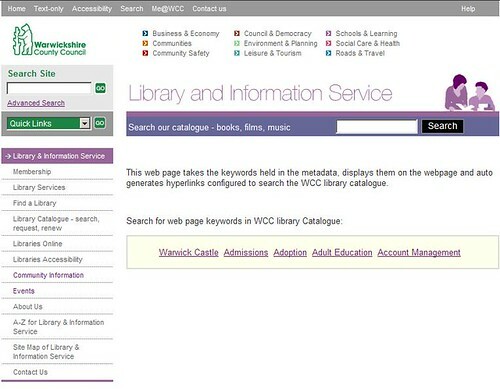 The WCC system for managing library transactions includes services for querying the catalogue. 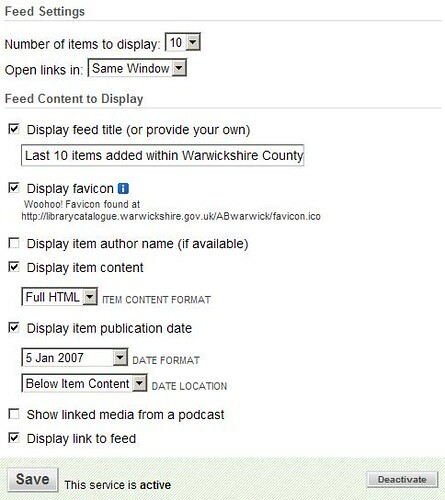 An RSS feed can provide information on new catalogue items, or a specific feed can be accessed based on a search query. Can these services (or other WCC services) be combined with commercial web services to both enrich the user experience and potentially provide commercial opportunities for the organisation? 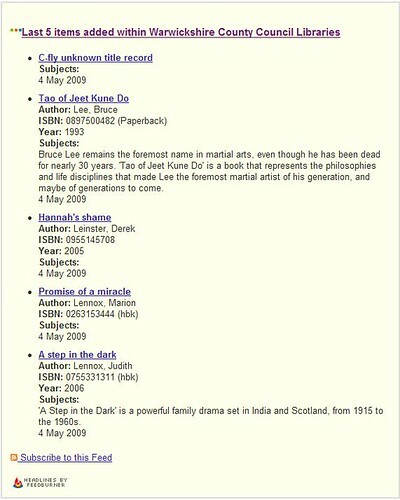 Setup twitter feed using twitterfeed.com, based on the 'New catalogue items' RSS feed from our library catalogue database. Finally I was trying to achieve something similar to the below for our own library books. Where we could use both the Google Books API to produce a Google Preview button and also use the Amazon API to show reviews and ratings. Unfortunately due to time this wasn't possible to complete. Describe how you approached this piece of work, any technologies, tools or techniques that you found useful or tried and discarded. Include any examples that you used for inspiration and any contacts you have made in carrying out the work. I started this project by first exploring different ways we could combine existing commercial web services, into these already existing RSS feeds in order exploit them further, to either help promote them within our own site or to provide a completely new web service. Following this I looked at way's we could further use the existing library catalogue search facility and expand the use of this further within our own site. Finally I started to delve a little deeper into the use of external API's such as Google Books and Amazon to see how the use of these could enrich the user experience. I started by 'burning' the existing 'New catalogue items' RSS feed into FeedBurner. 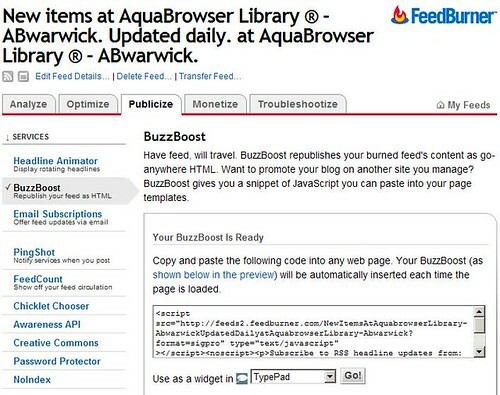 Once added you can setup the BuzzBoost tool in order to republish the RSS feed as HTML. Once setup you can copy the HTML into your own website, see below. On setup you can configure the how the feed is displayed within the HTML, See below screenshoot. Using both the BuzzBoost configuration settings and custom CSS styling I've embed the generate HTML into our own web pages database, see below. and the external TwitterFeed web service. I won't dwell too much on the configuration of this as I know its been covered in previous R&D project's, but its quite simple and only minutes to setup. After thinking about this, it occurred to me that every page on our site that uses the Web Pages database has a meta keywords field that needs filling out when creating a new web page, see below picture. In reality this is probably not the best way of doing this, but does prove the concept. The best way would be to add another computed field within the web pages database that generates a list of the keywords with links which is then displayed on the actual web page. If desired we could also give content authors the choice of whether to displaying these keyword or not, using a Yes/No display option while edting the Notes web page document. However I couldn't get it to work and reading from other peoples comments they too were experiencing problems. Describe the degree to which the work was successful in addressing the project description. Include reasons why or why not. The initial part of the project involved exploring different ways we could combine existing commercial web services with our own library catalogue. This proved very useful as it demonstrated how quickly these web services from FeedBurner and TwitterFeed could be used in conjunction with our existing library catalogue to enrich the user experience and also help promote our library catalogue service. The next part of the project involved extending the Library catalogue search facility to other parts of our site using a 'Get' post URL. This is a reasonable simple idea, that could have far reaching consequences as it becomes possible to hyperlink a web pages keywords in order to search for them within the library catalogue database. This facility could be replicated across the majority of web pages on our site. The final area was investigating relating web service api's to help enrich the user experience. This was a bit more involved and it was disappointing not to have developed anything tangible. However the Silverlight books website show's what's possible. If only I had more time. What immediate impact could the output of this R&D work have on the organisation – could it provide benefits without compromising our strategic approach? Certainly the use of Feedburner and Twitterfeed could be setup and used quickly without compromising our strategic approach. This would allow us to display RSS feeds like 'New catalogue items' as HTML on our website and also setup a TwitterFeed relating to new Catalogue items. Extending the library catalogue search facility would probably involve updating our webpage database, so perhaps that could be classed as compromising our strategic approach slightly, however it would not be a big change and perhaps could be implemented if future updates to the web page database are required. How the work carried out fits with our strategic direction or how it should contribute to our strategic thinking. Definitely the use of commercial web services such as Feedburner and Twitterfeed fits in with our strategic direction. As even if the underlining feed source changes these intermediary layer will remain constant making the transition from one underlying source to another more transparent. The below web services API's could possibly be combined in some way with our own Library Catalogue system to enrich user experience.